Party Rental deliveries are now available on Saturday and Sunday. 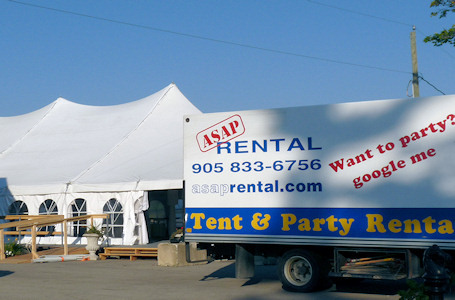 Starting March 1st, ASAP Tent and Party Rentals started offering weekend delivery. There will be a small surcharge over our regular weekday delivery rates but the combined price is still less than some of our competitors charge for normal delivery. As well as regular weekend delivery we will also be doing trial evening deliveries. Please note that there may be some limitations on delivery size as we are using a smaller weekend delivery truck. Call for details. This entry was posted in Party Rentals and tagged delivery, party rentals, saturday, sunday. Bookmark the permalink.